I'm lying on my back, looking up at the sky. My knee feels broken. I'm not sure if I can get up. I'm suddenly glad for the downward slope of the railroad embankment; if I'd collapsed on the tracks, I might have been run over. And that would definitely have ended the day on the wrong note. To my right is a Tupperware graveyard; vessels of food and water set out by well-meaning office workers to feed an army of vagrant cats. A gray tabby looks at me curiously, sniffs and continues eating. I'm not dead yet, she must be thinking, not yet food. To my left: woods. Behind me are the railroad tracks I've just crossed in search of my third geocache of the day. The cache I'm now certain I'll never find. The cache that broke me. The signal from my GPS led into a parking garage, then behind a suburban office building, and then up onto the railroad tracks. Then, perhaps misreading the signal, I thought I might be headed to the elementary school even further south, but I realized my mistake and headed back. Now the signal seems to be coming from a flat, open area to the west, just down the hill from the tracks, down the hill from where I lie motionless, immobile and broken. I should give it up. 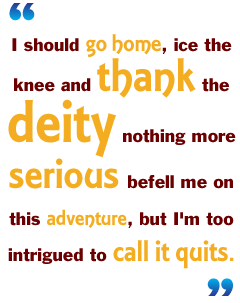 I should go home, ice the knee and thank the deity nothing more serious befell me on this adventure, but I'm too intrigued to call it quits. There's something about geocaching that awakens a primordial instinct, a deeply repressed longing to explore. Memories return of lazy summer days staring at pictures of pirate maps, wishing you could find an old piece of parchment with an "X" on it; wishing that "X" took you somewhere new and secret; wishing you'd find, under the "X," a hidden treasure, left there for you by some other adventurer willing to share, tying you into his secret world with a slender thread only you and he can see, invisible to the rest of the world. As a child that dream fades quickly. No one really hides treasure for you to find, you realize. And if you try to hide it yourself, you'd already know where it was. If you're lucky enough to have children to play with, making maps soon gets tedious. They're either too easy or too hard, and either way, the TV always seems far more interesting to your erstwhile fellow explorers. Perhaps there's a lesson there. Perhaps they know treasure hunting is hard work. Perhaps they're the smart ones. Nevertheless, if you're like me, you've harbored a secret desire to revisit those piratical dreams, scouring the hidden places, Conrad's white places on the map, to find the treasure only you know is there. If only someone would hide something and then provide a map. To the geocacher, the world you can see is just the beginning. A cache could be found in practically every thicket, behind every structure or even down the hall from your office. Their world is webbed with invisible threads, tying them to the caches they've found, the caches they've hidden for others to find and the one's they're sure are there but haven't yet discovered. In geocaching parlance, people who don't geocache are called "muggles," a reference from the Harry Potter novels to people who don't use magic. It's an apt allusion. The ability to walk into the woods and, in a matter of minutes, find a capsule no larger than your thumb must involve magic. And if you adhere to Clarke's law that advanced technology effectively is magic, then geocachers, tracking hidden objects using satellite locators, really are wizards. When I first heard about geocaching, I was a muggle. I didn't want to be a muggle. I wanted to be a wizard. So I bought a hand-held GPS unit for just over $100, created an account at geocaching.com, entered my ZIP code, wrote down the coordinates of a few caches near my house and went caching. I figured, at the very least, I could increase my number to one. Worst case, I'd fail miserably, but still have an interesting story to tell.